In the applet below, the pink angle and the blue angle are said to be supplementary angles. Interact with this applet for a minute or two, and answer the questions that appear below it. In your own words, describe what it means for 2 angles to be supplementary angles. 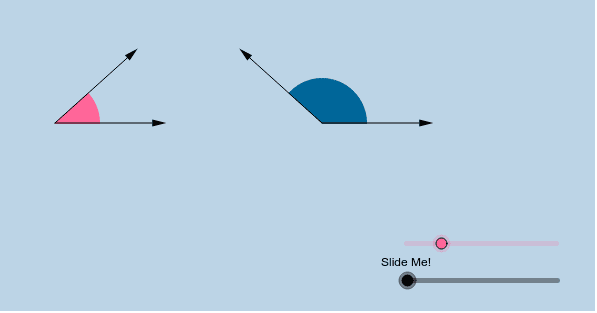 In the applet above, the blue angle is said to be a supplement of the pink angle, and vice versa. Given this information, determine the supplement of a 130 degree angle. What is the supplement of a 1-degree angle? What angle measure has a supplement whose measure is equal to itself?